Have you seen a memorial trophy before and not realised what it was? Parents were heartbroken at the loss of their sons and daughters. Some wanted to make sure their memory would live on at their child's former school, so they often donated prizes and memorial trophies. Maybe you’ve been given one at school prize-giving before? Victor and Oscar Gallie were exceptional students at Wellington College. They were both athletes - Victor had been on the 1st XV in 1909 and both were excellent runners. Both brothers rose to the rank of Captain during the war and were awarded Military Crosses for their efforts. Their parents would have been proud, but still anxious and terrified of hearing bad news. Only Victor returned home although years later, he died of the wounds he’d received during the war, from which he had never been able to fully recover from. Oscar and Victor's parents outlived their sons. Clearly devastated by the loss of both boys, they gifted the Gallie Memorial Shield to Wellington College in memory of their sons. They also established a fund in their sons’ names as a way of making sure their memory lived on with future generations. You have been given a photo of the Gallie Shield. Oscar and Victor Gallie's father donated the shield to Wellington College in memory of his sons. You are now tasked with discovering more of the story behind Oscar Eugene Gallie and Victor James Gallie. How much of their story can you piece together? The suggestions below will help you on your research journey. The When We Search Fact Sheet will also be a helpful tool in helping you discover the pieces of Oscar and Victor's puzzle. You're in luck. Both Oscar and Victor served in the New Zealand Army so their records can be found online at the Auckland War Memorial Museum Cenotaph. This is your most important search. Collect as much information as you can. Once you've found the brother's Serial Numbers move to Archway and search for their service documents there. DID BOTH GALLIE BOYS DIE IN THE FIRST WORLD WAR? The official New Zealand Roll of Honour totals enlisted personnel who between 5 August 1914 and 31 December 1923 were killed or died from injuries sustained in battle, illness, accidents and other causes connected with the First World War. Oscar and Victor Gallie both died as a result of the First World War. Why is only one of them counted on the Roll of Honour? what memorials are there for victor & oscar? The Gallie Memorial Shield was an important prize at Wellington College for many years and was awarded to the form obtaining the highest aggregate points at the annual athletic sports. 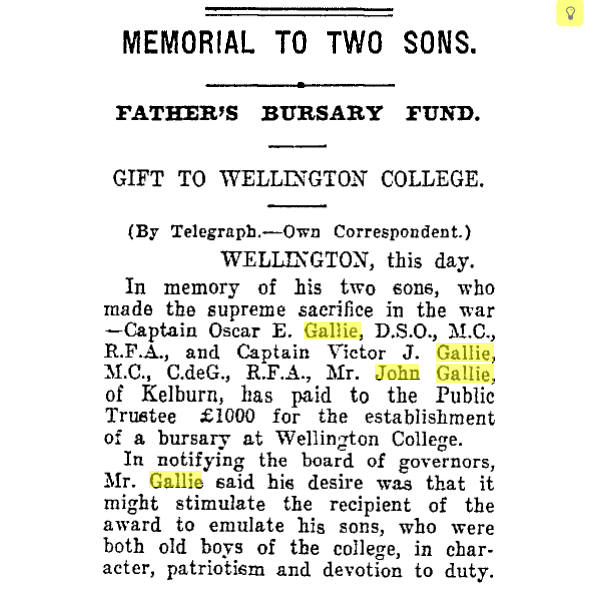 Use Papers Past and search for the term 'John Gallie' to discover another Memorial Prize given to the school in his sons' name. Use the Reserve Bank Inflation Calculator to calculate the amount of money the Prize would be worth today. Find more pieces of Oscar and Victor's Story. Oscar and Victor Gallie both received medals and honours for their war service. Can you use Google and Papers Past to discover what those medals were? Use Papers Past to search for the term 'Victor Gallie' and find Victor's letter home to his father describe his war in graphic detail. At which location did Oscar receive his medals? Use Papers Past to search for the term 'Oscar Gallie' - can you find the description of how he died and the letter sent to his parents from the King and Queen? Victor had been a member of Wellington College’s highly successful 1st XV of 1909. What can you find out about his sporting success at school and shortly afterwards. WHY DID OSCAR AND VICTOR FIGHT IN TWO ARMIES? Use Papers Past to search for the term 'Oscar and Victor Gallie'. An article announces that Oscar and Victor have returned home from Samoa and are off to join 'Kitchener's Army'. Use Google to find: What was Kitchener's Army? What happened in Samoa at the start of the First World War? Oscar and Victor's "first army" was the New Zealand one but what were the names of the "second army's" Regiments they each ended up in? what did VICTOR GALLIE LOOK LIKE? Of all the people with stories in the WW100NZ Discovery Box, most have a photo or a portrait where we have been able to discover what they looked like. Victor and Oscar's father was adamant that his sons' memory lived on. His gifting of Prizes to Wellington College is evidence of this. Victor was awarded two significant medals and Victor and Oscar are both remembered on the Gallie Shield and yet we have been unable to find a portrait of Victor anywhere. Wellington College have almost a complete set of portraits of their Roll of Honour and yet Victor, for whom the school awarded a prize is missing. His photo must be somewhere. The Gallie Memorial Shield is connected with the story of Oscar Eugene and Victor James Gallie who attended Wellington College. The original shield is held by Wellington College Archives.Despite best efforts relatives of Oscar and Victor were unable to be contacted. The Walking with an Anzac Team found the first clue in Oscar and Victor's stories when they visited Wellington College. The establishment of a bursary at Wellington College was arranged by the boy's parents. The scholarship was first awarded in 1930 recognising good character, scholastic merit and games participation – qualities the Gallie brothers displayed. Further research on the same platforms you have used today allowed us to discover the brother's stories.